Advantages: Good basic coverage of German Airship use. Disadvantages: In view of the title, additional pages would help. Airships have always had an air of mystic about them. In World War I the perils of being a crewmember were very real. Anyone that has read the diaries of these brave souls can attest to that. Charles Stephenson has made the latest contribution to Osprey’s New Vanguard series with a look at the use of these giants. The book starts off with a summery of the often-confusing numbering scheme that occurred when the airship entered into military service. Not only was there a manufacturer’s designation and number but also a military service number and designation. The numbering system differed between the Army and Navy with the former employing some very unusual practices, especially when renumbering replacement airships. We are then taken through the first attempts by Count Zeppelin to develop a practical airship. After numerous failures, he found success and was able to translate this into much needed sales. To provide competition for Zeppelin, the Army fostered a rival in the form of the Schütte-Lanz Airship Company. The next section sees the reader told of these gas filled giants being used during the First World War. 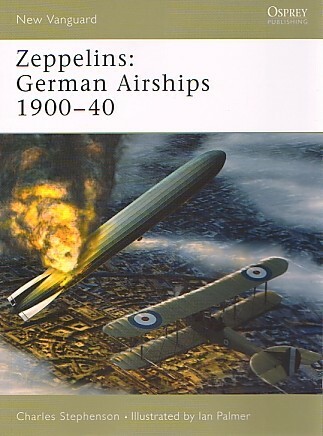 This includes raids against London, being attacked by enemy aircraft and the development of other classes of Zeppelins. For a detailed look at these classes, one must seek information elsewhere. The development of airships continued after the war with their use in the civil environment culminating in the tragic destruction of the Hindenburg. This is related in the final part of the book. A useful appendix contains a table of all the known airships, their specifications, and their fate. Ian Palmer provides eight pages of colour plates. These include twelve profiles of airships from the pre WWI period through to the start of WWII. It would have been helpful to have a title under each image instead of having to dive to the captions at the end of the book. There are 40 black and white photographs that show a broad range of subjects and some interesting diagrams are also added to the mix. There is certainly a lot to cover between the pages of this book. It is not one that is designed to take the reader through the technical aspects of the airship. That would take a book many more times the size of this one but one can’t help wanting a little bit more information in some areas. Nonetheless it is a good book that will give the “first timer” a good introduction to this fascinating aspect of air travel.